At the end of the year, Skyline Board of Education decided to reduce janitor’s hours due to budget cuts, so cleaning classrooms was eliminated from their daily schedule. This change has caused another situation to show up in classrooms. Since teachers no longer have someone taking care of their room and keeping it neat, some seem to think it is now considered the student’s new responsibility to take care of their room. 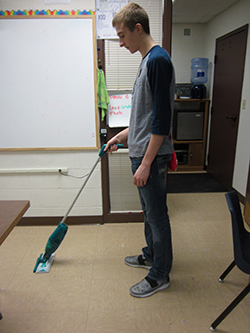 Junior Jared Shriver sweeps teacher Judy Hampel’s classroom. She used cleaning as a punishment for misbehavior. “I think classrooms should be vacuumed really well once a week. Elementary more, because they do a lot more crafts at the younger age,” high school principal Herb McPherson said. Cleaning a room can take quite a bit of time when wanting it to be considered clean. Some teachers are taking time out of their student’s work time and learning time, which takes away from students getting the best education they can. “Cleaning is not my favorite thing to do. I haven’t had students clean my classroom yet, simply because it is not their job to do,” band instructor Bob Lee said. It seems over the past few years, teachers are expected to do more chores, earn less money, and still be expected to teach the same amount, if not more. Teachers would like to come to school, teach, and go home to their families without having to do a bunch of extra things, considering they don’t get paid for overtime. On the other hand, budget cuts are a reality, and these adults were given a classroom to teach, and should be thankful for the space they are given. Therefore, they should take care it as if it were their own house. Maybe they could encourage the students to respect this space as they would their own house too.